The world’s biggest stars pulled out all the stops with their outfits for this year’s Met Gala, designed to fit the controversial Heavenly Bodies: Fashion and the Catholic Imagination theme. Celebrities from the worlds of fashion, music and both small and big screens came together for the biggest event in the fashion calendar – and their looks did not disappoint. From Papal tiaras and crucifixes to long trains and angel wings, attendees interpreted the theme to varying degrees at the gala held at the Metropolitan Museum of Art and organised by esteemed Vogue editor-in-chief Anna Wintour. So how did the stars put their spin on the controversial theme? Rihanna’s arrival on the red carpet made a statement amongst the stunning gowns of celestial silvers, golds and black. Dressed as a more fashionable version of the Pope, Rihanna’s 2018 Met Gala ensemble wowed with its pearls, crystals and papal mitre. The dress, a pearl-embellished Maison Margiela Artisanal gown by John Galliano, also featured a matching robe and headpiece. 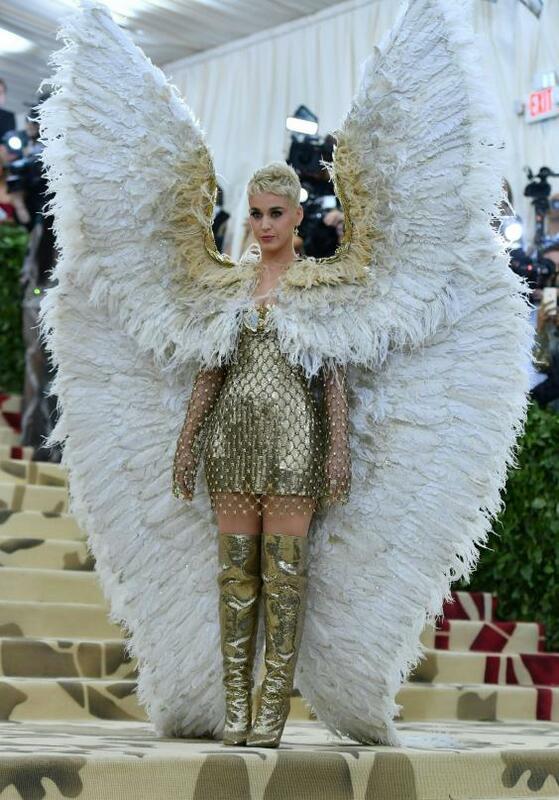 Katy Perry’s interpretation also turned heads – the singer arrived in a short gold Versace dress with gold thigh-high boots, but the focus of her outfit were the life-size feathered angel-inspired wings that completed the look. Alternatively, Kate Moss opted for a short black Saint Laurent dress with small black wings. Other celebrities incorporated the theme in simpler ways, with many opting for a crucifix to accent their gowns, despite the fact that wearing religious symbols as fashion accessories is considered unacceptable by many. 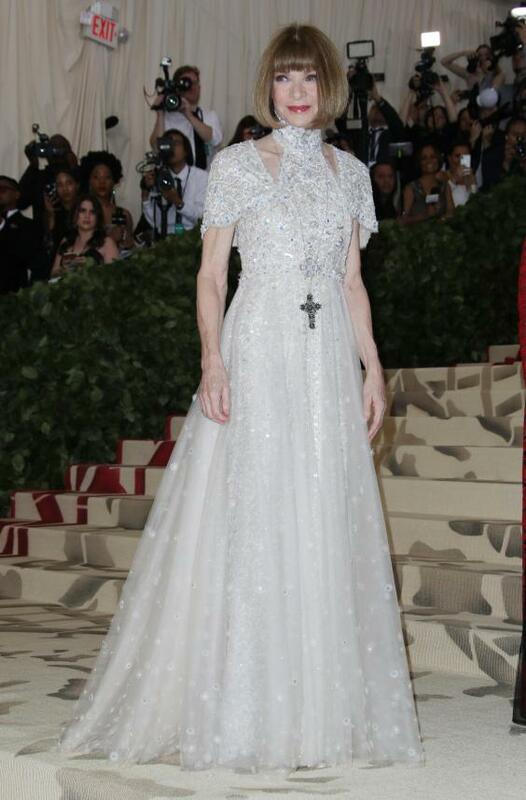 Vogue editor-in-chief Wintour arrived in a white custom Chanel sparkling gown with a long cross necklace. Crucifixes also appeared in model Laura Love’s outfit, who opted for a short black Versace dress with red and green crosses. 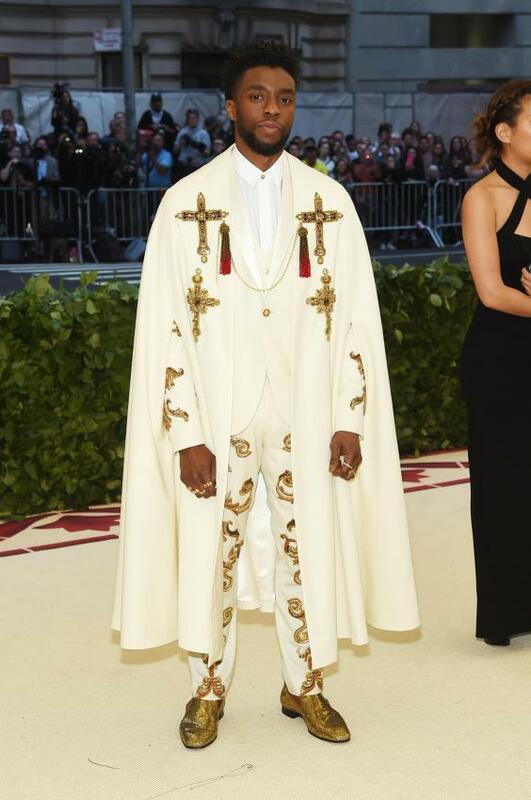 Co-sponsor Christine Schwartzman accessorised with the religious symbol, opting for a double-layered gem-encrusted crucifix to pop against her blue gown, as did supermodel Bella Hadid, who wore a simple cross necklace with her black Gareth Pugh gown, and Chadwick Boseman, who donned a Pope-influenced ensemble. Lily Collins took the theme a step further with her own interpretation – she accessorised her black off-the-shoulder Givenchy gown with a silver halo, a red teardrop and a rosary. Last night’s exhibition, hosted by Rihanna, Amal Clooney, Donatella Versace, Anna Wintour and Stephen and Christine Schwartzman, featured over 40 pieces on loan from the Vatican. Pieces include items such as Pope Benedict XV’s silk cape, displayed alongside pieces from Coco Chanel, Versace and John Galliano. This year’s theme was considered the most controversial yet, however, curator Andrew Bolton has defended his choice. “Some might consider fashion to be an unfitting or unseemly medium by which to engage with ideas about the sacred or the divine, but dress is central to any discussion about religion,” he said.